Reposted from the Marine Conservation Science at Brown blog with permission. The wind was blowing hard out of the north already at 8 AM and was predicted to increase. We squeezed into an old white pick up truck that Sara had already loaded with our gear, and drove south. The peaks of the Sierra de la Giganta hugged us close from the west. Not far past the airport, we passed the ‘clam shack’, famous with locals and visitors alike for its abundant servings of the local specialty, the Mexican chocolate clam. Not long after, Sara turned sharply to the left down a short road that ended at a small pier. A large white ship with a smokestack labeled ‘The Un-Cruise’ was docked at the pier. 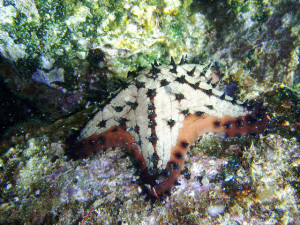 A chocolate chip sea star. Photo by David Galvan, used under Creative Commons licensing. We’d arrived at Puerto Escondido, the hidden port. This was the same bay Steinbeck, Ricketts and their crew sailed into 75 years ago on their journey through the Sea of Cortez. We’d come to the Hidden Port in search of some of the same creatures Ricketts and his fellow travelers had sought out: plump chocolate chip seastars, delicate fernlike stinging hydroids, and brashly colored sponges. It seemed like a humble spot to explore the diversity of what Jacques Cousteau called ‘the world’s aquarium.’ While the distant vista was full of the cactus spiked islands, right in front of us were defunct concrete pilings, a beach full of dinghies in various states of functionality, and another pier that looked little better. 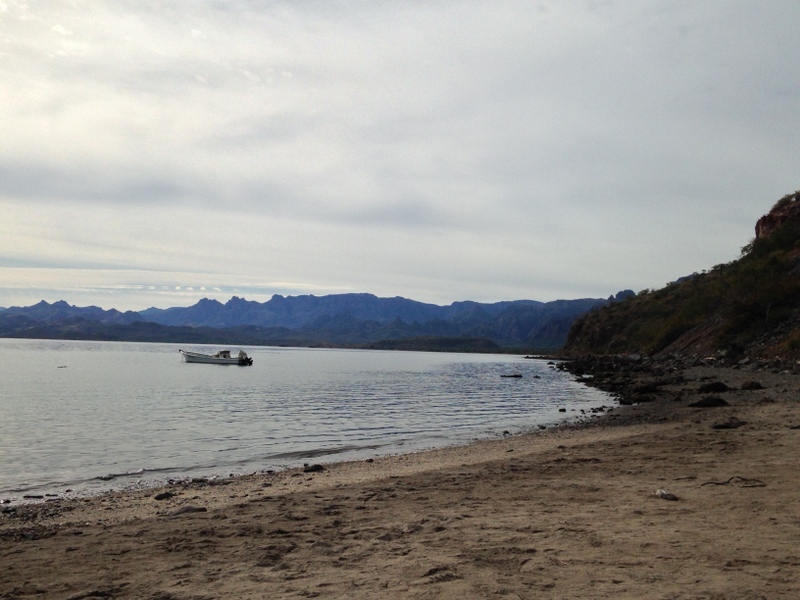 The day before we had dove at the north end of Loreto Bay National Park, in boulder fields dense with fish, just south of Coronado Island. We glimpsed blue whales spouting as they arrived for their annual feeding time in the Gulf. I wondered what we would see here. **** We descended to the foot of one of several abandoned piers. Oysters, hydroids, sponges, and crustose algae clung to the concrete structure. When we had talked on the beach about the plan for the dive before suiting up, Sara mentioned that the site was full of rusted old pipes and other abandoned hardware, but more as a clue to potential habitat than as a warning about possible hazards. Sure enough, I spotted two of gorgeous tiny puffer fish, playing on the underside of a defunct pipe at about 20 feet. The water was murky. A fine silt covered the bottom and blew up like smoke when I touched it with my fin. 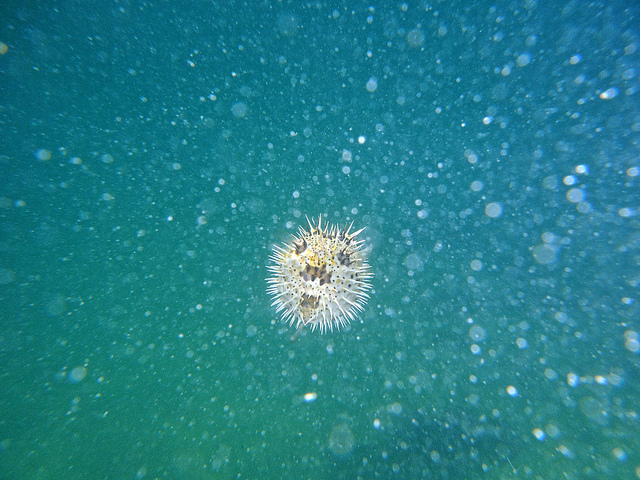 A puffer fish near the islands of Loreto. Photo by Kirt Edblom, used under Creative Commons licensing. We couldn’t see very far in any direction, which added to the mystery. Fish swam in and out of view, attracted to any type of structure, whether manmade or not. After exploring around the base of the pier, we swam along the jetty, towards the ‘Un-Cruise Ship.’ Panamanian sergeant majors, hand sized fish with elegant yellow and silver stripes, schooled by the rocks, surrounded by cabrilla, handsome (and tasty) sea bass that can grow as long as a person’s arm. Puffer fish steered their way among the crowd, tiny fins somehow propelling their teardrop shaped bodies. Cochitos, or finescale triggerfish, swam with undulating, even strokes, even though they—like the puffers—have mysteriously undersized fins for the size of their tall, thin bodies. All of a sudden, Sara motioned at the rocks with great excitement. “Big #(&*ing deal!,” her hand signals indicated. I looked more carefully at the rocks below, but didn’t see anything I hadn’t seen before. I could watch the continuing moving throng of multi colored, multi patterned fish all day, or at least as long as my air lasted. My eye was drawn to the little, brightly colored fish: the blue damselfish defending their few squares inches of turf, the senoritas, with their zebra stripes and magenta blush, zipping around in a group. And then I saw it, two bulbous eyes, close together and following our hovering shapes. Jaws were opening and closing lazily, just a bit, revealing sharp teeth. I realized the Cortez halibut or lenguado, while very well camouflaged, hadn’t chosen the best rock. It was so large that half its body was draped beyond the boulder’s edge. But its coloring blended perfectly with the rocks, gray and brown and white muddled together. I’m not sure if the fish was getting ready to catch a meal of its own or was avoiding becoming someone else’s. Big fish like this are important contributors to healthy marine ecosystems. They produce many more offspring than their smaller brethren, and as predators, they also influence the behavior and numbers of other organisms in the places where they live. It was hard to imagine what besides one of us could possibly catch and consume such a massive fish. Given the flatfish’s size, I suspected that even the powerful sea lions that swim among these islands would have a hard time gulping it down. **** After we surfaced, we enjoyed a lunch of tortillas, beans, and fresh goat cheese from the sierra. We ran through our species lists, marveling at all the life we’d seen within a few meters of the broken down pier. People fish from the jetty all the time, Sara remarked. Yet that halibut looked pretty comfortable and clearly had been around while, judging by its size. As we packed our gear back into the truck, I wondered whether luck or shrewdness would keep the halibut happily hidden. Heather Leslie is the Peggy and Henry D. Sharpe Assistant Professor of Environmental Studies and Biology at Brown University. She is co-editor of Ecosystem-Based Management for the Oceans.